The Lufbery Legacy Lives On! Raoul Lufbery, WWI Flying Ace, made his mark on history and his story is preserved in Special Collections and Archives at Wright State University. We had the pleasure of hosting his great nephew, Raoul Lufbery III, and his wife, Lynn, in the reading room on September 20. Raoul Lufbery III bears a marked resemblance to his famous great uncle. Raoul and Lynn were in Dayton to attend the World War I Dawn Patrol Rendezvous at the National Museum of the United States Air Force that took place September 22 & 23. This two-day flying event of authentic and replica World War I aircraft is offered every other year by the museum and the Great War Aeroplanes Association. Gervais Raoul Lufbery was born on March 14, 1885 in Chamalières, Puy-de-Dôme, France, to an American father and French mother. He served in the United States Army from 1907 to 1909. Lufbery would join the Foreign Legion as a mechanic at the beginning of World War I, later receiving his pilot wings in 1914. He was attached to the Lafayette Escadrille, an American flying squadron. He was very successful against the enemy, shooting down at least 17 German planes. On May 19, 1918, Lufbery’s plane took a direct hit from the enemy. In order to escape the burning plane, he jumped and died instantly when he was impaled on a fence post. Lufbery received full military honors at his funeral and is interred at the Lafayette Memorial du Parc de Garches, the shrine honoring the Lafayette Escadrille, just outside Paris, France. Lufbery was enshrined in the National Aviation Hall of Fame in 1998. I asked Raoul Lufbery III to share some thoughts on his great uncle. 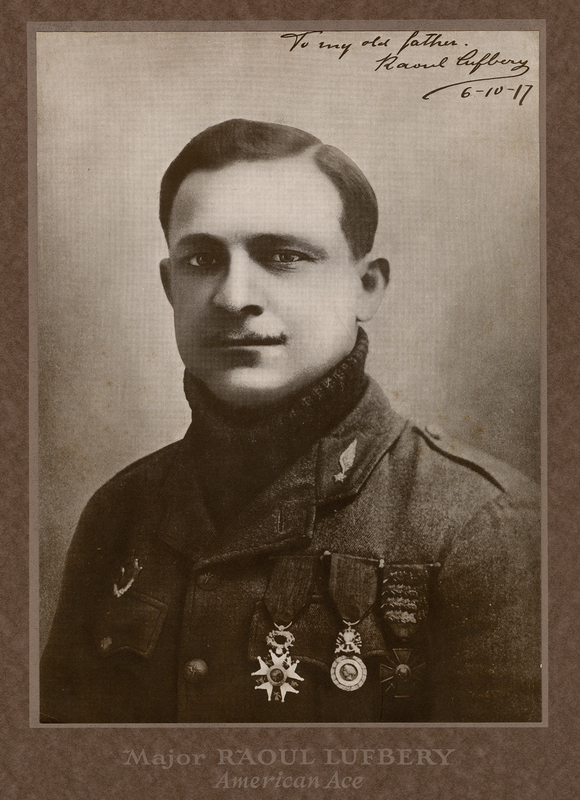 It’s an honor to be Major Raoul Lufbery’s namesake and to represent him at many WWI memorial and remembrance events both in the U.S. and France. Major Lufbery was a remarkable man and an outstanding pioneering WWI pilot who ultimately sacrificed his life for our democratic principles and the many personal freedoms we have today. I do my best to share his numerous military aviation contributions with the public and remind all to be grateful and appreciative of our nation’s active military service members and veterans from all past wars and conflicts. -He was modest, reserved, and a quiet man that never wanted glory, fame or the considerable nationwide media coverage he got during the war. Major Lufbery just wanted to win the war for the U.S. and our European allies. -Raoul became the first American Ace by shooting down his fifth enemy aircraft on October 12, 1916. Ultimately, he shot down more enemy planes than anyone else in the all American Lafayette Escadrille squadron. Raoul became a triple Ace on December 2, 1917. -Major Lufbery was fearless, had excellent 20/10 eye sight, and was considered the strongest man in this 38 pilot squadron. He had mental and emotional attributes that provided him a sharpness to make excellent decisions under extreme stress or life and death sky fighter dogfight engagements. -Many military scholars and war historians consider Major Lufbery a founding father of the U.S. Air Force. He had all the “right stuff” among the elite few to be considered as one of the “best of the best” that ever flew military fighter combat missions. 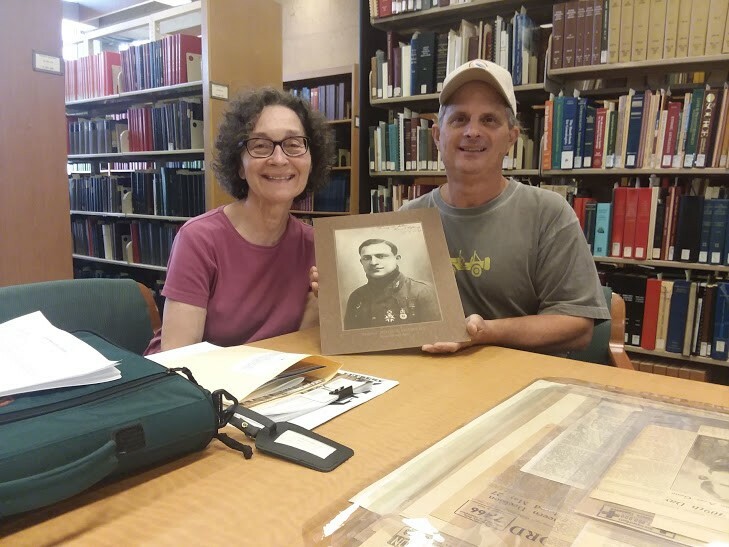 I’m grateful to the Wright State University Libraries Special Collections and Archives Department for preserving the Major Raoul Lufbery collection that came their way through my great aunt Germaine Lufbery (Major Lufbery’s step-sister). Having access to these materials produced two newly discovered Major Lufbery photographs and three detailed newspaper accounts of his remarkable WWI aviation accomplishments. The archivist/collection staff members were extremely helpful and aided my understanding of the collection organizational and retrieval system. Lisa Rickey provided excellent service and went the “extra mile” by sending me three digitized scans of Major Lufbery photographs. She also provided two hard copies of Major Lufbery magazine articles. My sincerest thanks to Lisa and Dawne. This entry was posted in Aviation, Collections, SC&A and tagged aviation history, MS-502, Raoul Lufbery, WWI, WWI100. Bookmark the permalink.